Is it really possible to find investment buys in the sales? I have to be honest - not often - I had to scour the internet to create this blogpost. But occasionally, you uncover an amazing gem, a great example being the polka-dot Sophie Hulme trench coat below, reduced by an amazing 70% from £545 to £163 at Avenue 32. Polka dots are one of the few, enduring prints that never-date. 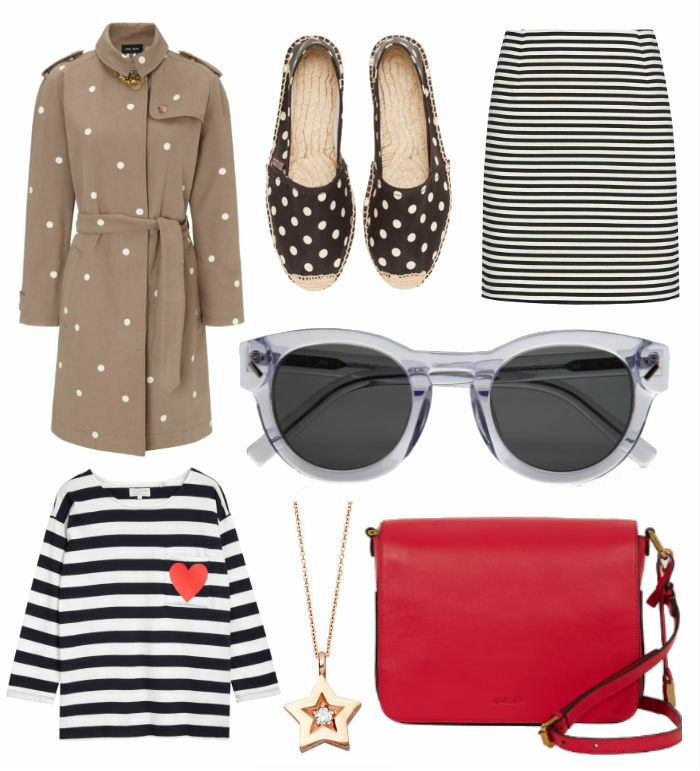 I know, I know, a polka dot trench might seem like quite a wacky buy - but in reality it's as wearable as they come. Use it to add interest to jeans + t-shirt ensembles or clash it with florals and stripes J.Crew style - in fact, I can't think of many outfits a hint of polka dot doesn't enhance. Likewise striped styles are great sale buy - I love Chinti and Parker's subtle twist on a breton tee with the addition of a cute heart motif. A classic leather bag is an investment you will never regret, and the Jaeger sale is full of them. Don't be scared to inject a bit of colour, a pop of pink livens up most colour palettes and will take you through autumn/winter. Have you invested in any bargains in the summer sales? Top row from L - R: Sophie Hulme polka dot cotton trench, Avenue32, was £545 now £163. Polka dot espadrilles, Penelope Chilver, was £85 now £45. Stripe miniskirt, Reiss, was £95 now £65. Middle: Acetate sunglasses, Kenzo, was £185 now £92.50. Bottom row L - R: Organic cotton stripe tee, Chinti and Parker, was 385 now £51. Rose gold and diamond star pendant. Astley Clarke, was £850 now £500. Large Lawrence bag, Jaeger, was £199 now £150 - £99.